To invite or not to invite, a question every couple faces when organising their big day and deciding whether to include little people on the guest list. Do we want children to attend? Will we offend anyone if we don’t invite their children, will they still come? What will we do if they are noisy or cry during the ceremony or meal? How can we keep them sitting during the speeches? Children can no doubt enhance a day, add a sense of fun and bring smiles to everyone’s faces; a flower girl scattering rose petals down the aisle, the cheeky grin of a toddler during the family photos or doing a funky dance during the reception disco but when boredom sets in or the sugar from the cake takes over you may wish you had put a bit more consideration it to their requirements! 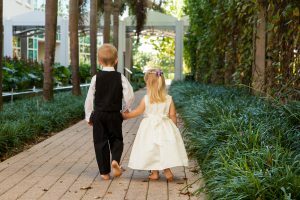 A wedding day is a long day for a child especially, as for the most part, they are required to be on their best behaviour and stay quiet as a church mouse. Well you can decide not invite them or, as with the majority of all other aspects of your day, you call in the experts! Nannies, babysitters, entertainers, children’s crèches – children are what they know best so let them help. Whether you invite 5 or 25 children there are lots of options open to you….. Event Nannies, they will come to your venue for a few hours or the whole day, they can accompany a individual family or care for a small number of children in a separate room and keep them amused and entertained with toys and activities. Hiring an event nanny is a flexible option as it can be tailored to the families specific needs. 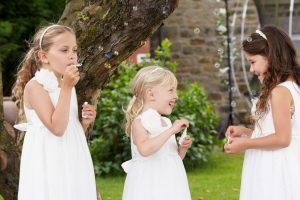 Babysitters are ideal for guests that want to stay at the event into the evening or those just attending your evening reception, little ones can go to bed whilst their parents enjoy the night time celebrations. They will come to the venue and look after the children in their own rooms, feed or supervise their dinnertime and get them ready for and put them to bed if required. Babysitters will most likely be off nannies, nursery nurses and childminders and hold a DBS check and First aid certificate. Our Mobile Crèche is an ideal solution if you have a lot of children attending your wedding, especially if they are a variety of ages. A crèche will provide a safe, fun environment filled with toys, activities, and games to keep everyone amused for hours. Depending on your requirements they may include arts and crafts, musical equipment, floor toys, party games, technology, a DVD player, educational and stimulating toys, a baby play area – soft flooring, baby toys, walkers, a bedtime area, story corner or outdoor games. Children love to be included and we find the best way to do this is through fun and engaging activities. Our wedding activity books are for children aged 3yrs to 10yrs and are full off fun activities, colouring, word games, mazes, jokes, puzzles, table games and more! Activity books can be personalised with the child’s name on the front so they can be used to highlight their seating place at the table or added to a bag/box with a few extras to create a special favour for the children. Extras could include, magic trick, balloon, some sweets, playing cards, a small toy, or some modelling clay.